These are the créme de la créme of the screen universe. They're convenient and require less effort to open and close than manual screens. 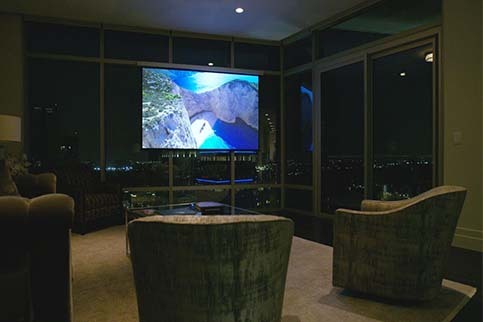 Available in ceiling-recessed, wall-mounted, ceiling hung (external), or ascending floor models, electric screens add a professional touch to a conference or board room and instant "wow" factor in a home theater setting. Electric screens are somewhat more complex to install than a manual or fixed screen, because they require a power source to operate. * All electric screens have, at a minimum, a fixed masking border attached.